Preheat oven to 180°C. Line baking trays with non-stick baking paper. Combine poppy seeds, rind and juice in a bowl. Set aside for 10 minutes. Meanwhile, use an electric beater to beat butter, sugar and eggs in a bowl until combined. Use a wooden spoon to stir in flour, bicarbonate of soda and poppy seed mixture until just combined. Drop heaped teaspoonfuls on lined trays, 5cm apart. Bake in the preheated oven, swapping trays halfway, for 12-14 minutes or until golden. Set aside for 5 minutes before transferring to a wire rack to cool. To make the icing, place icing sugar, butter and juice in a bowl and stir until smooth and glossy. Ice cold biscuits. YUM i say to orange and poppy seed too. yum! 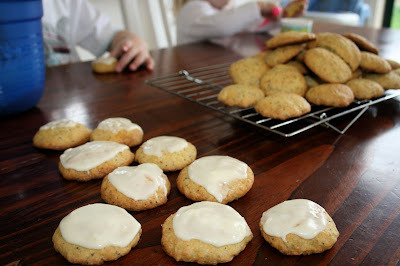 best idea ever toni-orange and popi-seed muffins are so good, but i never thought of cookies! hope the 3 kiddlywinks are behaving!